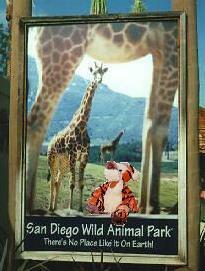 Tigger had fun visiting all his pals at the San Diego Wild Animal Park. 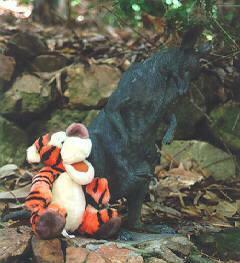 Tigger poses with one of his fellow felines. Note the similarity in their expressions...pretty scary, huh? 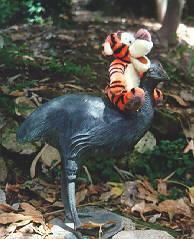 In the Australian Rain Forest, Tigger met up with some old friends - Kanga and Roo! Tigger travelled in Lee's pouch - though as you can see he kept trying to jump out. Maybe he was trying to tell us something? 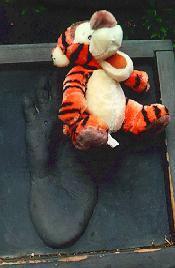 Big gorilla foot. 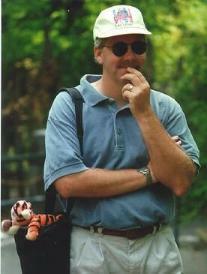 Small Tigger. 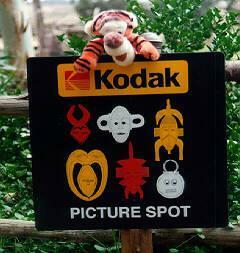 Tigger didn't really understand why this was a Kodak Moment, but posed anyway. 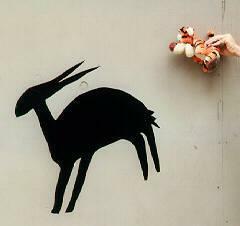 Tigger practices pouncing on some sort of antelope thing - there were lots of those! 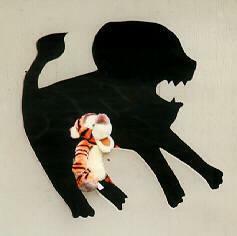 And pouncing is what Tiggers do best! Copyright © 1997, by Laura Gilbreath. Feel free to link to this document, but you may not redistribute it in any form without the express written consent of the copyright holder.